As your state senator, it’s very helpful for me to hear directly from you - the people I serve. I know it's not easy to travel to Olympia during a legislative session and our 12th District is so large there is no convenient central meeting location here. That’s why I look forward to holding my second annual “listening tour” next month. This year’s tour begins September 11 and ends September 14. Details about the tour and how to participate are below. I'll be visiting all four counties in our district with Senate staff. The upcoming tour includes some of the same stops as last year, such as Leavenworth, Wenatchee, and Chelan, along with several new locations, including Cashmere, Coulee City, Soap Lake, Waterville, Bridgeport, and Twisp. Some of the ideas shared with me during last year’s listening tour resulted in successful legislative action, including an idea from Leavenworth officials to dispose of brush and yard clippings, a funding request related to the Saddle Rock trail system, and other legislative suggestions. Conducting the listening tour in September gives my staff and me ample time to research ideas, prepare bills, and develop budget requests before the next legislative session begins in January. Like last year, I have invited my legislative staff and issue specialists to join me on the tour. It’s helpful for our communities to have these resources available when I meet with you, and it’s good for my staff to hear directly from people about issues of interest in our region. You're invited to Patterson Mountain community hike near Winthrop September 14 at 10 a.m. The 2017 listening tour concluded with a community hike up Saddle Rock, overlooking Wenatchee. (Click the links to view recaps of the hike from the Wenatchee World and NCWLIFE.) This year’s tour will wrap up with a community hike on Patterson Mountain near Winthrop. The hike will be Friday, September 14, starting at 10 a.m. 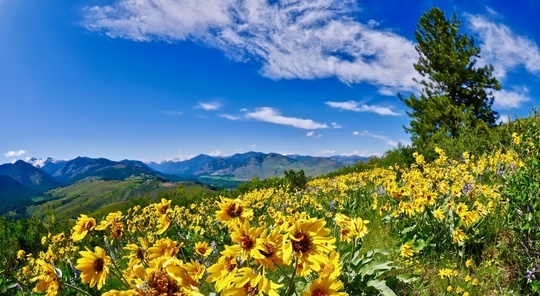 If you’ve never hiked Patterson Mountain, it’s near Sun Mountain Lodge and offers incredible views of the Methow Valley. Everyone is invited! No appointments or RSVPs are needed. If you join us on the hike, remember to bring sunscreen and water. 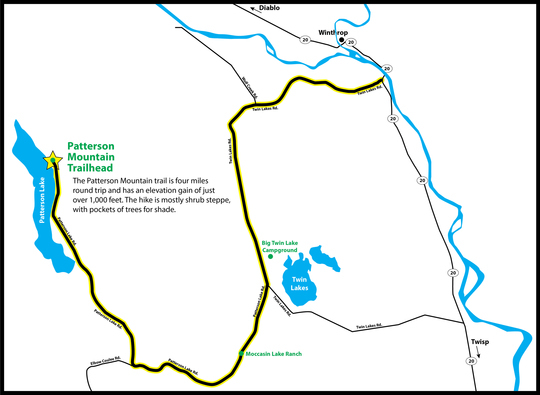 If you have a Discover Pass, you are encouraged to park in the Patterson Mountain trailhead parking lot. If you don’t have a Discover Pass, you can park on the road shoulder near the trailhead. 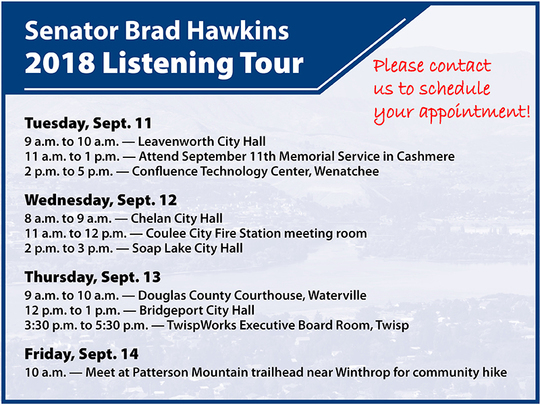 I hope to see you during the listening tour.